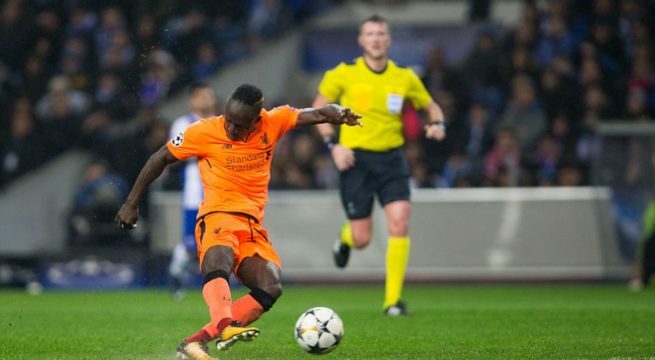 Sadio Mane scored a brilliant treble as Liverpool romped to a 5-0 thrashing of Porto at the Estadio do Dragao on Wednesday to march towards the Champions League quarter-finals. Mane fired the away side ahead in the first leg of the last-16 clash, before Mohamed Salah’s audacious finish for his 30th goal of the season quickly made it two. The Senegalese forward slotted in his second as Liverpool completely outclassed their opponents, with Roberto Firmino adding his name to the scoresheet with 20 minutes to play, before Mane’s searing strike completed his first European hat-trick. “It was important to play as a team and we did, we played great football from the beginning,” Mane told BT Sport. Playing in the last 16 of the competition for the first time in nine years, Liverpool are now all but certain to reach the quarter-finals ahead of the second leg at Anfield on March 6. Jurgen Klopp’s men had scored 23 goals in the group stage and continued that scintillating form in Portugal to become the top-scorers in this season’s competition, while the defensive frailties that have plagued them at times this season never resurfaced as Dejan Lovren and Virgil van Dijk put in accomplished displays at the back. “I saw a lot of fantastic performances tonight. The result is only possible if they are all spot on,” said Klopp. Sergio Conceicao’s deflated Porto will now turn their attentions back to domestic matters, where they hold a two-point lead in the league and are in the Cup semi-finals. Roared on by the home fans, Porto started brightly and Brazilian midfielder Otavio was denied an early goal by a last-ditch tackle from Lovren. But it didn’t take Liverpool long to grow into the game, as left-back Andrew Robertson fired over on his Champions League debut and Ivan Marcano’s brave block prevented Firmino from heading in. But the five-time European champions were gifted the lead in the 25th minute as Porto goalkeeper Jose Sa, who has replaced former Real Madrid great Iker Casillas this season, allowed Mane’s tame strike to squirm underneath his body and into the net. Mane has been overshadowed so far this term by the blistering performances of Firmino and Salah, but the Senegalese forward’s first goal in six games was his fourth in the Champions League.